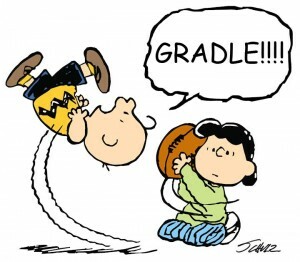 Oh, Gradle. You continue to be full of empty promises. are interlaced with any number of other excuses as to why your deficiencies are justified, or somebody else’s problem to solve, or that some incubating dead-end is political rhetoric enough to convince me that you are a swell technology still worth embracing. It’s tough when the head lemming lays claim to a bright future, yet fails to recognize that the rocks below are getting larger by the moment. The community is also adding valuable tools in this area, see the https://github.com/nebula-plugins/nebula-publishing-plugin which deals with Maven snapshots when publishing. As you said, eventually we want to have a core, coherent, full development lifecycle solution for this. No question. Whether this is THE most important thing to do is not as easy to answer. In the meantime, if you can spec out your requirements in more detail, that would be much appreciated input. It’s the equivalent of saying that they will “take [it] under advisement“. And really, what’s there to spec? Do they really need someone to provide new words to describe what Maven already does exceedingly simply and well? Admittedly, at first read, I eagerly clicked on the link to the nebula-publishing-plugin with great hope. Maybe it does fulfill my “oh-so-lofty” expectations. But I have yet to find a decent example of its usage. Honestly, there is no sense in me ranting any further, point by painful point. You can decide for yourself how big of an idiot I am for spitting out the Gradle Kool-Aid. And please, continue enjoying the music.